You've read about it, seen it and tested it -- now it's time to sell it. It's been five years since Microsoft last released a new desktop operating system. Now, after a lot of slicing, dicing and remixing of ingredients, the soufflŽ known as Windows Vista is finally cooked and ready to serve. Microsoft has taken great pains to assure the world that Vista is the most thoroughly tested, battle-ready desktop operating system ever. It offers a host of new features that promise to enhance security, reliability and performance. That functionality comes at the price of significantly increased system requirements, though, especially if your customers plan on using the Aero interface. Desktop alternatives from Apple and Linux are still just blips on the radar. Vista's strongest competitor is really its older brother Windows XP. Vista's adoption may well be driven by how much it outperforms XP, given that XP is itself a stable, reliable OS. There was always a solid business case for ripping out Windows 9x and installing Windows 2000 and XP. Replacing an unstable product with a stable one always makes good business sense. Here, it may be a case of replacing a good product with a better one. That's definitely a harder sell. You'll have to make a compelling case for your business customers to upgrade to Windows Vista. Fortunately, you'll have a lot to talk about. The major changes to Vista are in the areas of security, reliability and search. And those are certainly listed in order of importance. Ask any of your customers and they'll tell you the most dreaded day of the month is Patch Tuesday, the day Microsoft releases fixes for the newly found bugs in its OSes and related products. Although XP is far more secure than Windows 9x, it still needs too many patches, particularly in the Internet Explorer browser. Therefore, if there's one big difference between the old OSes and the new, it's security. That's probably your best opportunity when pitching an upgrade from XP. The User Account Control (UAC) in Vista is probably the most significant change from XP. The UAC lets users perform most functions with lower-level privileges, rather than having to be at the Administrator level on their computer. Thus, even if attackers get users' credentials, they won't be able to do nearly as much damage as before. One lesser-known aspect of UAC is that even administrators normally run in Standard mode. They'll be prompted to elevate their credentials for specific tasks. This will help in environments where rogue admins are a problem. The functionality of UAC is primarily what's made Macs more secure than Windows computers over the years. Microsoft has now caught up. ActiveX opt-in, which means most ActiveX controls are disabled by default and easy to turn off. Phishing Filter, which warns users about fraudulent or potentially fraudulent phishing sites. It will also block known phishing sites. "Protected Mode" (offered only in the Vista edition of IE7), which isolates the browser from the rest of the system, preventing malicious software from getting into the OS. Windows Defender, which regularly scans the computer and offers to remove spyware and adware, both increasingly used as attack vectors. Taken together, these security enhancements make a compelling case in and of themselves for an upgrade to Vista. It will be particularly reassuring to your customers to hear about the security enhancements made to IE7. Security is part of the overall reliability picture, but there's much more to reliability than just keeping things safe. True reliability is the ability to spot potential issues before they arise, to fix little problems before they become bigger ones and to back up and restore data if one of those problems crashes your system. Microsoft has upgraded Vista in these areas as well. One welcome change is built-in diagnostics. Wouldn't it be nice to know of an impending hard drive crash before it happens? That's the theory behind this feature, which is supposed to warn of hard disk problems, thus giving your customers time to save important work before the blue screen of death descends. Vista can also tell when an app is using too many system resources, such as virtual memory, and alert your customers before the situation becomes critical. The Network Diagnostic Framework (NDF) is part of that toolbox. This network troubleshooter helps users with file-share issues, wireless connectivity problems and difficulties connecting to Web sites. Other categories include memory and performance diagnostics. Vista can also fix its own startup problems. A boot-level failure automatically fails over to a technology called Startup Repair. This tries to correct the problem and start the computer with little or no user input. If your customers have to restore lost data, Vista includes a new Backup and Restore Center. This continues on the "Center" theme that debuted with XP's "Security Center" and continues with "Mobility Center." The Backup and Restore Center makes backing up data-probably the most-needed and least-performed task-much easier than in previous versions of Windows. The Backup and Restore Center includes a file and folder backup wizard, System Image Backup (which backs up system state data) and Shadow Copy Backup. Microsoft first included Shadow Copy with Windows Server 2003. It takes "snapshots" of files, then lets users return to previously stored versions of those files. Shadow Copy works on the local computer on a server share. It can save IT staffers a huge amount of time by allowing users to find their own deleted files rather than relying on IT to track them down. Restore data comes from the Shadow Copy, which is different from XP's previous restore method. Microsoft says the new restore process is more efficient and robust. Changes in the security and reliability aspects of Vista could affect an IT department: If it works as advertised it should need less support, meaning that your customers can significantly trim IT costs. Although security and reliability will be Vista's major selling points (and with good reason), the improvements over XP don't end there. Vista's search capabilities and overall performance (with the appropriate hardware) have also had a major rework. Although Bill Gates didn't get his pet project WinFS into Vista, that doesn't mean it's bereft of new search technology. In fact, quite the opposite is true. Desktop search (called Instant Search) is powerful, quick and embedded in more places, such as Explorer windows. Search Folders is another addition. 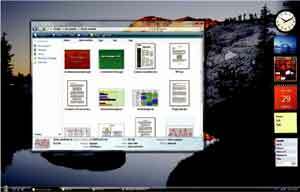 These save searches and add similar topics to the folder for future searches. For example, if you search for "Matt" and "sales," Vista will save those search terms in a Search Folder. The next time you save a file with "Matt" or "sales" in the name, that file will be automatically sent to that Search Folder. Vista is also claiming better performance than XP. This claim is worth a skeptical look, however, given Microsoft's history of making products bigger and more bloated rather than smaller and faster. To back up its performance boasts, Microsoft points to several new features, including "Windows SuperFetch." SuperFetch is supposed to intelligently determine your usage patterns. It records which programs you use most, what features within those programs you use and even when you use them (for example, Excel during the day and Flight Simulator at night). It then loads those programs into memory beforehand, which saves load time. It also prioritizes tasks, moving certain jobs you don't perform as much into the background. The other potential performance gain comes from a technology called ReadyBoost. ReadyBoost lets a user plug in an external memory device such as a USB thumb drive. Vista can then use that as additional memory. It's like adding temporary RAM. If Vista sales start out sluggish, is that an opening for Mac and the myriad flavors of desktop Linux to make some inroads? Possibly, but if history is any indication it's unlikely. Linux, and especially Apple, have carved out their niches and have yet to gain any real market share on Windows. What's more, they seem fairly comfortable with the current situation. Apple is still strong in creative markets such as publishing, music, film and video. Linux continues to offer viable (and much cheaper) alternatives to Windows, and has made headway in foreign markets much more so than in the United States. Neither entry is a serious threat to either XP or Vista. Figure 1. The new dialog boxes give your customers more file information than their counterparts in Windows XP. This view also shows the mini-apps called Gadgets, like the clock and calendar. Figure 2. The new Search Folders make it easy for your customers to organize and locate files, without having to remember where they're stored. 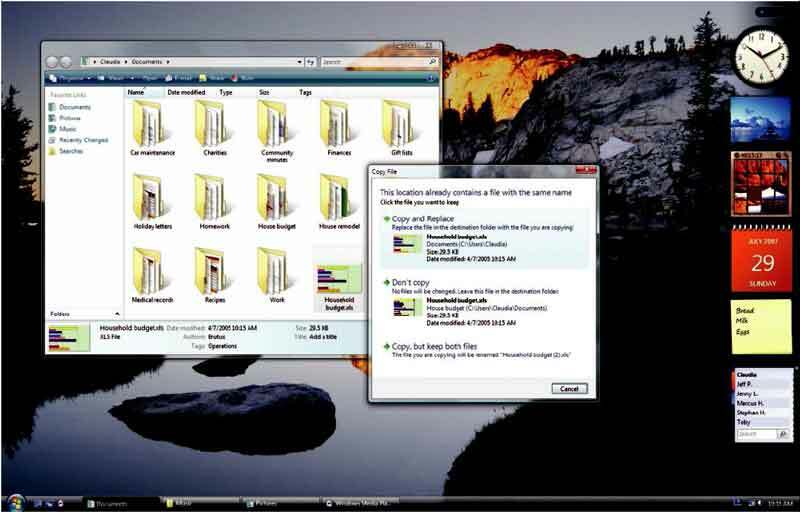 Each folder is connected to a saved search. Certain applications and technologies-such as the Firefox browser that has steadily gained on IE and Google, which is the Microsoft of search-are doing well in their own spaces. Microsoft is, of course, green with envy at the success of the iPod, iTunes and other assorted gadgets coming out of Cupertino. However, those developments aren't any threat to the Windows hegemony. No, the greatest threat to Vista is Windows XP. That's why Microsoft is working hard to distinguish the two. Its sales strategy emphasizes several factors that add to Vista's value proposition. One aspect is the enhanced security features such as User Account Control, IE7 Protected Mode and BitLocker Drive Encryption. Better security means fewer crashes, viruses and malware across the network. That adds up to lower IT and infrastructure costs. The other factor is reducing costs through "well-managed" environments. Microsoft is distinguishing well-managed environments from "typically managed" environments, and defining "well-managed" as a state that adopts desktop management best practices. Vista, Microsoft claims, is easier to bring to a "well-managed" state. Once there, it's easier to maintain. Early customer reports suggest that Vista can lower IT costs by as much as 50 percent. Those figures are certain to be optimistic, but that's the story Microsoft is taking to market. Before your customers can manage any environment, they'll have to put it in place. Deployment is another cost they'll need to justify. Microsoft's answer to that is providing more efficient deployment and migration tools. Those include better application compatibility tools to ensure that legacy programs will still function. There are also hardware-independent Vista images that significantly reduce the number of images your customers will need to maintain, lowering complexity and costs. Windows Vista Home Basic: First in Vista's batting order is Home Basic ($199). This version gets the job done, but on a very limited basis. It's lacking some major upgrades that appear in the next step up, Home Premium. Because Home Premium costs just $40 more, it's hard to make a compelling case for Home Basic under any conditions other than a severe budget crunch. Home Basic can't support more than a single processor. The 32-bit version supports up to 4GB of RAM, while the 64-bit version doubles that amount. It lacks Windows Media Center, Windows Movie Maker, the Encrypting File System and the Aero interface. Windows Vista Home Premium: Home Premium ($239) is more expensive than Home Basic, but has much more functionality. It supports two processors and adds the multimedia features that Home Basic lacks. This version can also do scheduled backups. It's better for laptops, with Windows Mobility Center and Tablet PC support built in. Neither of the Home versions can join a domain, a limitation they share with Windows XP Home. Windows Vista Business: The Business edition ($299) is the entry-level offering for corporations, but it packs a punch. Vista Business supports up to two processors and 4GB of RAM in its 32-bit version, and 128GB in its 64-bit incarnation. These are the same standards for Vista Enterprise and Vista Ultimate. Windows Vista Enterprise: The key differentiator between the Business and Enterprise versions is Windows BitLocker Full Drive Encryption. BitLocker enhances security by encrypting an entire hard drive rather than just selected files or folders. It's a welcome technology in these days of stringent regulations such as HIPAA and Sarbanes-Oxley and frequent reports of laptops loaded with sensitive data being lost or stolen. Enterprise is only available through a volume license. Windows Vista Ultimate: Ultimate ($399) is for your customer who wants it all-all the business functionality and security, plus all the media goodies and fun stuff. It includes everything found in all the lower-tier home and business versions of Vista. Microsoft's marketing theme for Vista is a three-pillared, alliterative structure: Confident, Clear, Connected. Confident. Means your customers' networks will be more secure and run more smoothly and more reliably with Vista than with XP, previous versions of Windows or competitive platforms from Apple or Linux. Clear. Refers to the ease with which your customers will find and organize information with the new search functions and the Aero interface. Connected. Refers to communications enhancements such as better wireless connectivity and online security enhancements. Microsoft has many online resources to help get your team up to speed on Vista. A good place to start is Microsoft's partner page for Vista: https://partner.microsoft.com/40020336. You'll find online training in Vista fundamentals, a "Business Value Discussion Tool" and various community resource pages. Next, tab over one space to the right from the previous page and check out the sales and marketing page. This section offers columns by sales experts, an Enterprise Resource Guide for selling to the big boys and a Partner Marketing Center. Don't overlook the Partner Learning Center, accessible from the "resources" section of the Partner Program benefits homepage at https://partner.microsoft.com/global/40011586. This site has many sales training tools, and you can even set up a program that will track your sales representatives' progress. There are numerous learning formats, including classroom, hands-on labs and online courses. This training assistance is a benefit you get by virtue of being a partner, so why not take advantage? In terms of quick adoption, Microsoft faces a dilemma. Many of today's PCs won't be able to take advantage of many of Vista's features without significant upgrades. This is a bottom-line double-whammy. Not only is there the cost of Vista itself, but also the cost of upgrading hardware to be able to run Vista. Microsoft lists the minimum requirement specs for Vista as at least an 800MHz Pentium processor, 512MB of RAM and a DirectX 9-capable video card. As anyone who's ever used Windows in the real world can tell you, however, Microsoft's minimum specs are rarely realistic. Minimum recommended specs (which should really be considered the bare-bones minimum) start at 1GB of RAM, a 128MB video card and a 1GHz processor. How many organizations sport desktops with those kinds of stats? That's a key question that will be a determining factor in how quickly the business world adopts Vista. What will Vista's long-term impact look like? It's more difficult to tell than it was with previous versions of Windows. Windows 95 was a quantum leap from Windows 3.1. Its adoption was swift and widespread. Then Windows 98 came along, offering mostly minor upgrades from 95. Therefore, its adoption was slower and it didn't hit the market with the tsunami-like force of 95. Still, there were major problems with 9x. It was prone to crashing, it was insecure and it wasn't built well for network usage. All that led to Windows 2000, which cured many of those ills. Windows 2000 was really more of a stopgap system until the next big thing came along. That big thing was Windows XP. With a new code base, vastly improved security and greatly enhanced reliability, XP became the de facto standard OS for businesses and consumers. Vista appears to be somewhere between the revolutionary changes from Windows 95 to Windows 2000 and XP and the evolutionary changes from Windows 95 to Windows 98. It's not a new paradigm, but it does add many new features and truly enhances important aspects of the operating system like security, reliability, predictability and searchability. The problem is that it's not replacing a poor product. XP is solid and reliable. It's been maturing for five years and has enough positives that there should be no pressing need to upgrade for most shops. That means a tougher sell for you. Don't be surprised if Vista starts off slowly and builds momentum over time. In the end, given Microsoft's dominance, it will probably be as widely adopted as XP is now. At the very least, you've certainly got something to keep you busy until "Longhorn" server comes out.